Gutters are one of the most commonly neglected parts of the house due to homeowners not knowing what exactly it does for them and what trouble it can cause if it’s poorly maintained. Neglected gutters can damage the foundation of your home over time which might lead to costly repairs. Did you know that more often than not, unsightly streaks and stains on most houses are caused by clogged gutters and downspouts? Poorly maintained gutters can also lead to many other serious problems. Having your gutters cleaned on a regular basis will not only prolong your home’s beauty, but will also prevent unnecessary repairs that can be very costly. We would love to help you avoid the same mistake. But why choose us? 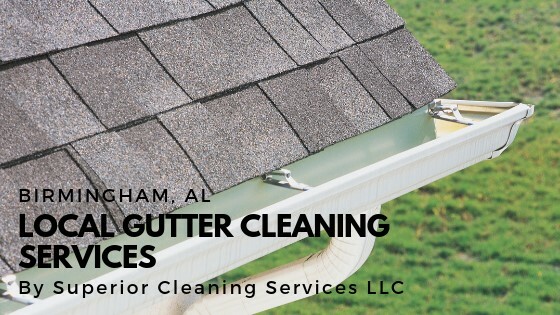 With over 15 years of experience in gutter cleaning, Superior Cleaning Service LLC will provide only the very best service that you and your home deserve. We’re local and we’ve been in business long enough to develop a good reputation around Birmingham. Just check out a few of our reviews on Google. Our cleaning process includes a complete and thorough inspection of all your gutters and downspouts. We ensure that after we’re done with the work, your gutters will be free from loose debris and your downspouts are clear and free-flowing. On top of that, we have full and comprehensive insurance to ease your mind. And if that isn’t enough, all our work is performed with you as the owner/manager present if requested. At the end of each cleaning, we provide a detailed report of any the issues we had identified during the cleaning process. This will help you identify what problems (if there are any) that needs urgent attention, as well as to prepare for any costs that might be needed to address them accordingly. Our cleaning doesn’t end on your gutters and downspouts as we also clean up all debris that gets on the ground as well as the surrounding areas with a blower. Ready for a superior gutter and downspout cleaning? Call us at (205) 427-5296 for a FREE estimate.